1st question: First of all, did you plan to be a wrestler when you were young? No, when I was young, I played hockey and I thought that I was going to make it as a hockey player. But once the sand box stage of my life was past, a wrestling ring replaced it. When I was young, wrestling was one of my dreams but in adolescence, it was mainly hockey and I paid less attention to wrestling! 2nd question: If wrestling hadn’t come along, was there another career you’d have liked to follow? Well, I wasn’t good enough for hockey but, if I had been, I’d have liked to play hockey professionally . Being Québécois and living in Montreal, my idol was Patrick Roy. I was a goalkeeper and that’s a bit like wrestling, As a goalkeeper, you’re on your own, you have the crowd looking at you, it’s you who determines victory or defeat and you have the whole world’s attention. You stop a goal, you work the crowd... it’s a bit like wrestling. You can play the crowd. You can put on more ketchup! Every time you stop a goal, it’s like creating a spectacle. 3rd question: How did you get your start? Through the MTV show Tough Enough. I had to do an audition in New York because I didn’t know how to wrestle. It was an easy way to enter the business. I wasn’t kept on the show because it was for US residents. But the director at that time, Kevin Dunn, liked my work and we kept in contact. One day they said they’d be interested in employing me if I completed wrestling school. So I found myself some trainers. 4th question: Did you watch WWE when you were young? Yes. I went to see Hulk Hogan with my mother. I also went with my father to the Forum when it was still The Montreal Forum. I still have the programs. Hulk Hogan ruled! I watched WWF, Sunday morning at 11am, translated into French. Unfortunately WWE doesn’t translate its shows any more, only TNA. That’s why I stopped watching - they stopped the translation and I didn’t speak English at the time. 5th question: Is there a wrestler who inspired you and still inspires you today? 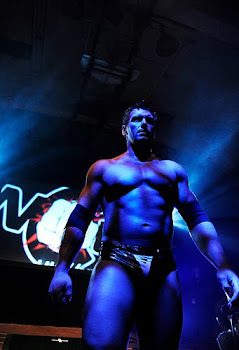 6th question: What do you think when you come back to Québécois wrestling? By that I mean, do you try to be cool and make a good impresson with everyone or do you try and keep a professional distance? For me, it’s work - I’m just going to work. I just try to be myself. There will be people you like and people you don’t like, the same as in any workplace, the office or wrestling ring, There is always a world which loves you and which you do not love. But I do try and help as much as I can because there are a lot of federations in Quebec which have very good ideas but sometimes they don’t quite pull it off. I’ve worked in WWE and now with TNA, so I can sometimes help out with ideas and finishes. The physical element is very important in wrestling but there also has to be spectacle and often it’s the spectacle that’s lacking. People forget it’s a movie, a story…sometimes I bring something creative to the table. 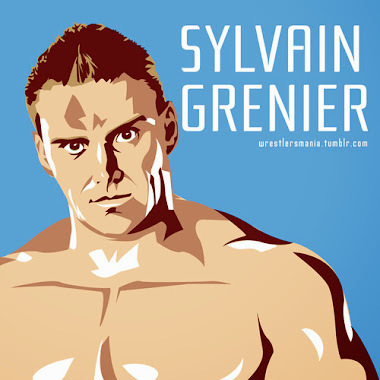 7th question: Is this possible that one day we’ll see a wrestling school run by Sylvain Grenier? Hum, that was proposed to me. But, for the moment, I’d prefer just to run seminars. A wrestling school requires a lot of time and I couldn’t always be there and I’d need to train staff and at the moment I don’t have the time. But there are so many talented young people here, it might be a good idea to start with seminars, if people are interested. I would have to find a place that suited everyone. But it’s likely I’ll start working full-time again soon and, meanwhile I have RDS. So, for the moment a wrestling school is on ice - but given the right circumstances, I’d be interested in pursuing the idea further. 8th question: If I asked you to tell me something positive about WWE, what would it be? Well, it’s the largest wrestling company in the world and therefore a privilege to work for.... I had the chance to work with Hulk Hogan, The Rock... There’s nothing negative about any of that. But for all the positives there are also negatives. With a company as large as this, there are good times and bad times. There are times when you agree with what the company is doing and there are times when you disagree. But as an employee, what can you do? You can give your opinion and sometimes it’s well received and sometimes not so well. It was certainly an extraordinary experience. I got all my experience there and I’ve developed the power to grow in other ways. Perhaps the day will come when I’ll go back but for the moment it’s not one of my projects. I have TNA and other offers and I’ve moved on to other things. 9th question: Where there people in WWE with whom you became friends - who you enjoyed being with? Yes, I had good friends. Unfortunately, distance makes it difficult to keep up with them. Christian is a very good friend. Dave Batista was close when we travelled together. 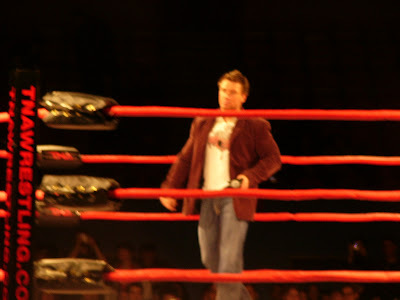 Also Simon Dean and Lance Cade. 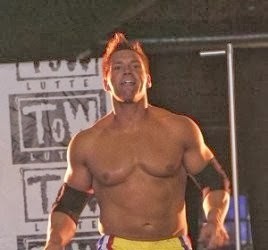 Rob Conway and I had a lot of fun together, Hurricane was also fun and helped me a great deal. Big Show, also... I was spoiled, I never had problem with any of the other wrestlers. It was more the writers and agents who gave me troble because I gave my opinion. And really, I should just have kept quiet. The wrestlers understood me. I’m the sort of person who, if you take the time and effort to get to know me...and if we click, then we can have a good relationship. With Rene, we didn’t click. You can’t force thesethings. Sometimes it’s just better to go your own ways. 10th question: As a Quebecois and speaking French, it would have been difficult to feel at home? Yes. Everyone is a racist but doesn’t like racists! I had a different language, different attitudes, and they had well rehearsed stereotypes! Certain people might have interpreted my behaviour as arrogant and provocative but they don’t know me. That would be only their first impression. And if they got stuck with that, it’s their own problem. It’s not my problem! 11th question: At the time of our supper at La Cage Aux Sports du Quartier Dix-30, you said to me that WWE saw you primarily as a male model. You said you’d have liked them to see you differently. How would you have liked them to see you? With my look and limited experience, they first of all limited me in what I could do. Tag teams are fun but they’re also very limiting. They never seriously tried to see me in any other way. Timing is everything, and the timing wasn’t right for me. But I think it’s everyone should be given a chance and let them run with it and it’s been proven so many times with people who didn’t seem to have much talent but went on to do extraordinary things. In my opinion, if you have the will and you have it in inside you to kjeep going... well, I know that I have it, I want to keep doing it, and I ‘ll just keep doing it. There are ten million ‘stages' to perform on, and promotions everywhere. WWE it is only one. 12th question: You have conducted several seminars in different places! Is this something you’d like to do on a long term basis? That depends how things go - certainly the seminars are fun. Normally, they last a day or two and they’re condensed. I enjoy doing them once a month, then getting the chance to see people improve, and put what they’ve been taught into practice and observe the change in the shows. It’s not possible to run a seminar for all Montreal wrestlers. I prefer to work with specific promotions and use the opportunity to pass on some of my ideas and experiences …. 13th question: if you had any advice for the Quebec federations, what would be it? I had a match two weeks ago…a half hour match, no chairs, no tables. And at the end of the match, people were standing, a standing ovation. There wasn’t even a bell. But people forgot because they were so caught up in the match. In one of the earlier matches, a guy was 18 feet in the air, on 3 tables.... But each one to his own style, I guess! 14th question: if you had some advice in the opposite direction, what the federations would be better off not doing, what would your advice be? Anything is possible but in moderation. A table spot has its place from time to time but if it’s used and re-used every show, it’s no longer special. There should be special occasions for these spots. If people aren’t able to have a good wrestling match and tell a story in the ring, they’re never going to be successful. Some fans come to see blood. But are these the fans you really want coming to your promotion. Do they buy the Tshirts? 15th question: what’s the best gimmick to be a successful wrestler? There’s no secret.... It’s important to find some aspect of your personality and amplify it a hundred million times. It’s also necessary that you be able to switch this ‘on' and ‘off' because if you’re always ‘on', it’s never going to work. Once the match is over and you come backstage, it’s important to become a normal person again. Kane in the wrestling ring is Kane. Kane in a movie is Kane. But when he’s backstage, it’s Glen again. He reads books and plays videos. He’s completely another person. He’s a monster and then he’s not a monster. It’s essential to be able to distinguish between persona and reality. With RDS I project part of my personality to become my character. A bit of my personality is multiped a hundred million times to become part of the spectacle. If I have nothing to project, nobody would be willing to pay to see me on television or at the shows. It’s that ‘specialness’ which separates the real world and the world of the stage. 16th question: what do you need to have to become a successful performer? It ‘s really necessary to understand psychology. A 5 year old child can do the actions but you need to understand peoples’ emotions. And you need to be able to go into the ring with little or nothing prepared. Like a match I had a few weeks ago. I fought as a face against a face and what are you going to make of it? You can prepare two or three things in advance but you have to ‘feel’ the match as you go along. You see what the reaction of the crowd is and play with this reaction. It was great fun. When we finished, I felt ‘that wasn’t work’. We’d succeeded in making people participate in a story that they wanted to take part in. Sometimes they supported the other wrestler, sometimes they supported me. This is where the fun is, in being able to adjust to the crowd. Look at Martin Matte... when he’s working in Montreal and tells a joke about Granby, it’s funny in Montreal but it’s not funny in Granby. You have to adjust! A joke that works one day doesn’t necessarily work another day. You have to pay attention to your audience and work with them. It’s the same in wrestling. You have to be ready to use all the little things that can add to the effect. A girl is shouting loudly on one side of the ring and you say to your opponent “OK throw me out on this side.” You fall close to her and you know that it will create attention. It’s like that, it’s a spectacle. You have to work with the feelings of the crowd to create the spectacle. 17th question: I’ve heard a debate between people who believe that matches should be improvised from A to Z and others who think they should have a certain structure. What do you think? Personally, I like to have a foundation and some ideas to make use of in a match. That doesn’t mean you’re necessarily going to use them. But things that you can contribute…. For safety reasons, it’s necessary that some spots are prepared ahead of time and it’s essential that they be tested out before the match. Personally, it seems more ‘real’, and I feel more like a ‘fighter’ in a ‘fight’, if the match happens without detailed preparation. I mean, it’s not a theatrical play and I wouldn’t like it to be like that. But particularly in the United States because of television, with the advertising breaks, all must go A, B, C... it has to be calculated! 18th question: In the WWE, your matches have to last a specific time? Everything is calibrated. The entrance lasts a specified time, you mike time is no more than 22 seconds. One goes to the advertising break in 15 seconds... it’s tightly framed. There’s really no freedom. 19th question: Is there a backstage environment you prefer? One where people are close or one where there is more distance? When we’re doing TV, there’s always a great deal of stress. But it’s always fun when you get along well with people you’re working with. When you know you’re trusted, you have your job to do and you get on with it…You’re ready. You have your own conditioning to do before the match, mental and physical. If you’re not ready, well you still have to go out there and there’s nobdy going to take your place. It’s a professional environment but it’s more fun when it’s relaxed and you can laugh. Work is hard and it’s nice if you can minimize the stress. 20th question: Is there anything that you would have liked to do differently? There are a lot of things. I would’ve liked to have had more trqining before starting on television. I was projected onto television very quickly. I was able to do the movements but I didn’t understand psychology... I had a plan. I followed the plan. So at the beginning, it wasn’t pleasant. And my lack of experience caught up with me later. That would be one of the bigger things. There are other things which I’d have perhaps done differently but there’s nothing that happens without a reason. It’s always important to learn from the good and the bad. Taken them onboard and move ahead and they’ll be useful to you next time round. Sure, you can indulge in regret and remorse but... it’s already in the past! The important thing is how you’ll react the next time it happens. 21st question: Do you have it in mind to wrestle until Ric Flair's age? No! I don’t think so. I’ve so many other projects I’d like to do. I love wrestling and always will, as long as I’m able to do it, but there are so much other things which I’d like to try. But wrestling will always remain part of my life. 22nd question: What would you like people to recall of your wrestling career to date? It’s a good question because I’m still a baby in the wrestling world - I’ve only been involved in it for 5 years. But when I end my career I’d like to be able to say that I was a good entertainer. That people liked to look at me and listen to me, no matter in which medium, wrestling, or television or anything else..... I'd like to be remembered as a good entertainer. For me it is one of greatest compliments to be regarded as an entertainer.